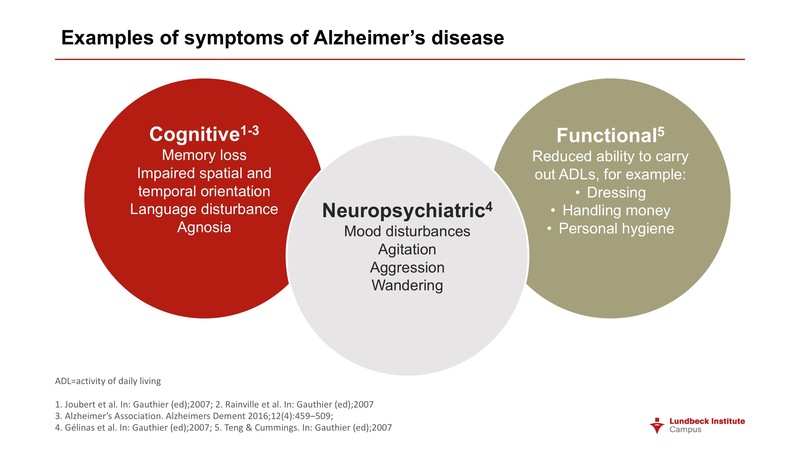 Agitation is a frequent and distressing feature of advanced Alzheimer’s Disease (AD) and other dementias and its adequate management – non-pharmacological or pharmacological – is a major unmet need. In the absence of agents that slow the progression of AD, control of symptoms – including agitation – is a meaningful therapeutic goal. Traditionally, the term “agitation” has been used to refer to a wide range of behaviors, with little consistency between studies. The recently-proposed consensus definition of agitation should help the field move forward both in our understanding of the phenomenon and in our efforts to treat it. The number of people living with dementia worldwide in 2015 was estimated by the World Health Organization at 47 million, reaching 75 million in 2030 and 132 million in 20501. On current trends, the number of people suffering from dementia will nearly double every twenty years. The worldwide economic cost of the disease – already more than 600 billion US dollars – will increase in proportion. Alzheimer’s Disease (AD) is the most common cause of dementia, accounting for 60-80% of cases.2 Other major subtypes are vascular dementia, dementia with Lewy bodies (cognitive dysfunction plus Parkinsonian symptoms in the presence of clumps of alpha-synuclein), and frontotemporal dementia. One in 9 people (11%) aged 65 years or older has AD.2 Around half of these cases are “pure” AD, and around half mixed dementias. In 2016, 5.4 million Americans had AD. Of these people, 5.2m were aged 65 and over. Women accounted for 3.3 million cases and men 1.9 million. AD is the fifth leading cause of death in Americans aged 65 years and over. While mortality from stroke, heart disease and prostate cancer fell by 23%, 14% and 11% between 2000 and 2013, deaths from AD rose by 71%. The hallmark pathologies are the accumulation of beta-amyloid plaques outside neurons and of tangles of tau protein inside,2 leading to inflammation, brain shrinkage, and the presence of neuronal debris. 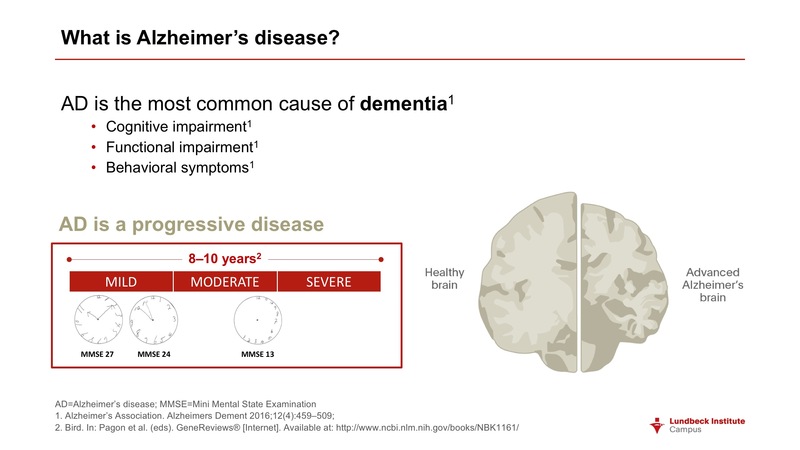 Brain changes may begin 20 years before symptoms appear.2 Mild cognitive impairment (MCI) is present in 15-20% of people aged over 65 years, and around a third of those with MCI develop AD within 5 years.2 However, MCI can be due to many causes other than dementia. A small proportion of AD cases (perhaps 1%), typically with early onset, are attributable to a mutation in amyloid precursor protein (APP) – which is cut into beta-amyloid fragments -- or the genes for the presenilin 1 or 2 proteins.2 Presence of these mutations makes development of AD almost inevitable. However, in most cases, the causation of AD is multifactorial, with both genetic and environmental involvement. Although dementia is not a normal part of ageing, age per se is the largest single contributory factor: 44% of people with AD are aged between 75 and 84 years.2 The global population is ageing, and by 2050 there will be two billion people aged over sixty. This makes a steep increase in the number of AD cases virtually inevitable. A family history of AD increases individual risk. More specifically, carrying one copy of the ApoE-e4 gene increases risk of AD threefold, while having two copies of this form of the gene increases risk 8-12 times when compared with people with other variants of the gene.2 Between 40% and 65% of people with AD have 1 or 2 copies of the ApoE-e4 gene. 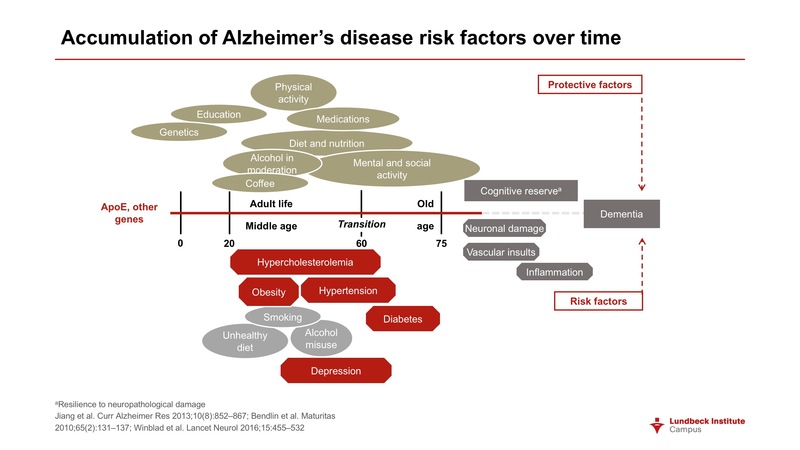 There are also many associations with modifiable lifestyle risk factors.2 Regular physical activity is protective against AD, as is lifelong learning and longer formal education, both of which may contribute to greater cognitive reserve. Traumatic brain injuries raise risk of developing AD, as do established risk factors for cardiovascular disease such as diabetes, obesity, smoking and hypertension. 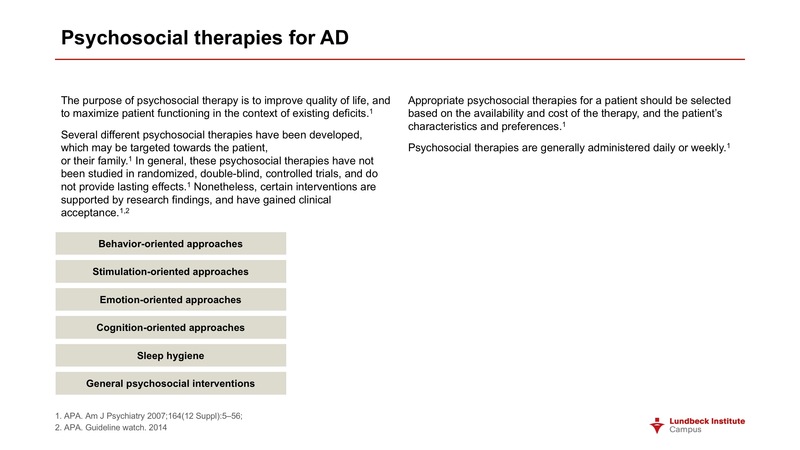 While cognitive symptoms predominate in AD, neuropsychiatric symptoms (NPS) including agitation and aggression are highly prevalent, potentially disabling, lead to seriously diminished quality of life in both sufferers and their informal carers, and are frequently the reason for transferring someone with AD from the community to an institution.3-5 AD combines elements of neurology and psychiatry, and classical psychiatric symptoms such as depression, apathy, delusions and hallucinations are frequently seen. encouraging participation in exercise and other social activities, along with reassurance and support, may have modest benefits; but behavioral interventions require the training of staff and the monitoring of effects on well-defined target behaviors; and the benefits are generally modest. NPS were evident in Alois Alzheimer’s first case: a woman who presented with emotional distress and jealousy later went on to manifest memory and wider cognitive problems, and at autopsy showed the brain pathology we associate with AD.3 Given the scale of the reciprocal neural connections between brain areas involved in cognition and emotion, it is not surprising that there is such a strong affective dimension to AD. 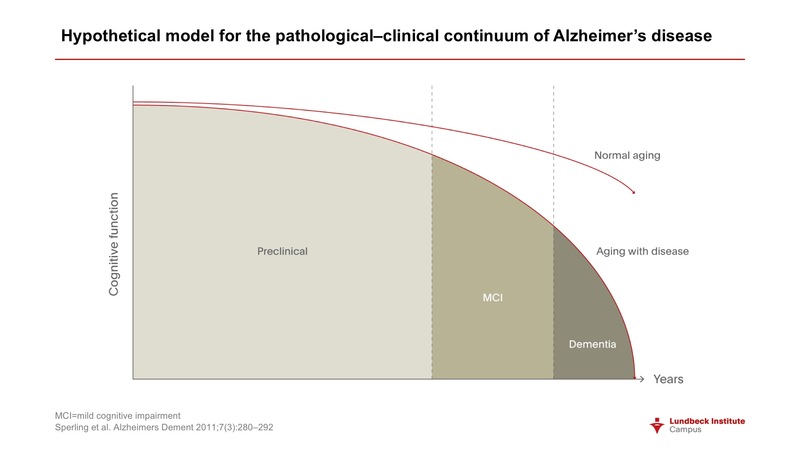 However, despite their presence in Alzheimer’s index case, neuropsychiatric aspects of the disease have in the past received relatively little attention. That position is now changing. Following a research round table on the topic convened in 2010 by the Alzheimer’s Association, an NPS professional interest group was formed within the International Society to Advance Alzheimer’s Research. Stimulating education and research in the area are its twin aims. The 2014 overview by Geda et al3 derived from that special interest group. In general terms, the review emphasizes the need for accurate measurement of symptoms, for encouraging the use of clinician-derived data as well as of data from carers, and for increased efforts to understand the neurobiology of NPS in AD. The role of frontal-subcortical circuits and cortico-cortical networks was recognized, along with the involvement of the ascending monoaminergic system through which the cell bodies of brainstem neurons producing serotonin, norepinephrine and dopamine project to all parts of the brain. The Geda et al review covers, in order of their prevalence in AD, depression (the most frequent NPS in AD), apathy, sleep disturbance, agitation, and psychosis. In this article, we focus on agitation. It has been recognized that the field would benefit from a consensus definition of agitation in the context of cognitive disorders.5 The International Psychogeriatric Association (IPA) formed a working group to develop such a definition with the aim of making it applicable to epidemiological, clinical and interventional studies (both pharmacological and non-pharmacological). Almost a thousand people active in the dementia field participated in the iterative consensus-building process. It was recognized from the outset that behaviors that might be considered “agitation” differ greatly from one person to another, and depend on context. But, when asked initially about the elements that should be included in a definition of agitation, the majority of respondents used the descriptors excessive, inappropriate, disruptive and repetitive. Among the specific behaviors mentioned were pacing, wandering, verbal aggression, unwarranted requests for help, hitting the self and others, pushing, throwing, screaming, restlessness, kicking, shouting and destroying property. evidencing behaviors that impair social functioning or activities of daily living that cannot be accounted for by cognitive impairment alone and that are not solely attributable to another disorder (psychiatric, medical, or substance-related) or suboptimal care. The four-point definition was agreed as being suited to both clinical practice and research by at least two-thirds of those participating. Although subject to revision in the light of experience, it is hoped that adoption of the definition will facilitate comparisons between studies and lead to progress in both non-pharmacological and pharmacological interventions. In the case of the latter, a consensus on definition may also assist in the submission of trial data to regulatory authorities. The establishment of a definition complements the rating scales which allow the frequency and severity of symptoms to be recorded: examples include the Cohen-Mansfield Agitation Inventory, the Behavioral Pathology in Alzheimer’s Disease scale, and the widely-used Neuropsychiatric Inventory (NPI). Agitation/aggression is among the NPI’s twelve domains. Agitation is frequently present in Alzheimer’s and other dementias. However, while it may include elements of physical or verbal aggression, this is not always the case – and agitation can be evident in repetitive non-aggressive behaviors such as pacing or rocking. A majority of respondents involved in the ADWG project regarded agitation as overlapping with aggression. The neuropathology of AD-associated agitation is still poorly understood, but it is likely to relate to structural and neurochemical abnormalities in specific cortical regions.4 Clinical and imaging studies suggest that frontal lobe dysfunction may be an important part of the underlying biology. Sultzer et al4 describe an association between agitation in AD as measured by the NPI and greater density of neurofibrillary tangles in the orbitofrontal cortex and anterior cingulate. Agitation or aggression have also been linked to specific examples of regional atrophy, hypometabolism, or alterations in neuroceptor binding. It is hoped that the greater understanding achieved by neuroimaging and neuropathology studies will identify specific phenotypes of agitated behavior and point to towards targeted treatments that can be deployed under the guidance of biomarkers. Such markers may also be helpful in plotting the course of neuropsychiatric aspects of the disease and in monitoring the effects of therapy. providing information and long-term support to caregivers. As discussed, one of the main behavioral problems encountered in AD is agitation. Sultzer et al identified lack of consistency in use of the term as a barrier to research,4 and this problem is being addressed. However, other needs are still to be fully considered. These priority areas include the better understanding of environmental and caregiver factors that promote or ameliorate agitation, and the development of practical, effective and safe behavioral and pharmacological interventions. These issues were recently discussed in an interview with Sube Banerjee, Professor of Dementia at the Brighton and Sussex Medical School, University of Sussex, UK. As an example of pressing unmet needs, Professor Banerjee identified effective treatments for agitation and depression, which are factors associated with dementia that substantially impair quality of life. These would complement any treatments we can develop to slow or stop the disease process and, ideally, restore previous levels of functioning. 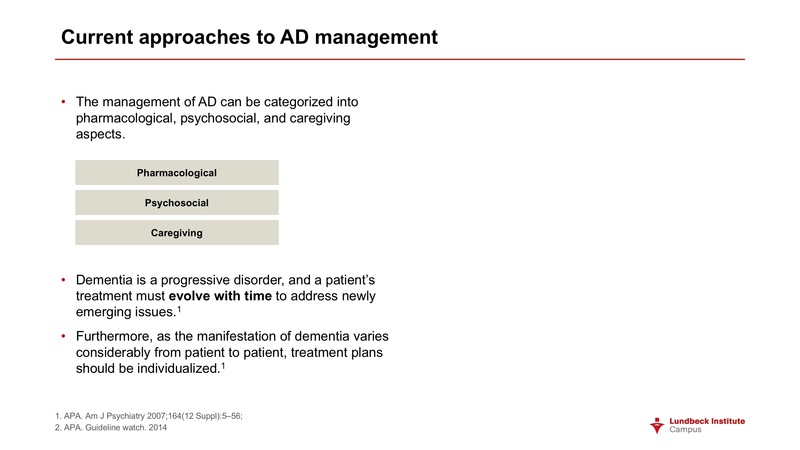 Simpler means of diagnosis, and reliable ways of differentiating AD from other forms of dementia, would also help. The causes of agitation vary to some extent between long-term care and outpatient settings. Precipitating and perpetuating factors in a patient’s home and in an institution may differ, since the nature and extent of social interaction, for example, is not the same. In a care home, where a number of people live together, each may have their own set of problems. Loss of a patient’s home in itself may cause agitation. In a care home, it is important to understand the roles of leadership and management, as well as the direct delivery of care. Agitation is a particular behavior of an individual patient in a specific context. It is a symptom, not a disorder in itself, and may be caused by many factors. It may be due to an underlying physical problem or illness, rather than to interaction with family or formal carers, for example. It is important to find out the cause or causes in the case of an individual patient. What are the exact antecedents? How do we rule out physical illness? And, Professor Bannerjee emphasized, the problem of agitation can sometimes be in the eye of the beholder. It may be possible to reconceptualize the behavior so that it becomes tolerable. How best to assess agitation depends on the services available. In the community, there is access to primary care, and then to secondary care services specialized in geriatrics and the mental health of the elderly. Services vary in the extent of their interest in agitation and skill in assessing it. The likelihood of successful treatment may depend on the nature of the agitation. It is important to define what would constitute success in a particular patient. What is the outcome that you want? Then see if has been achieved. Triggers for non-pharmacological or pharmacological interventions depend on the intensity of the agitation and the level of risk it poses in the particular situation. Non-drug treatment is based on identifying the causes and if possible modifying them. A period of watchful waiting is often a good starting point. This may mean changing washing and dressing routines, or changing the time at which a patient is woken. Many episodes of agitation are self-limiting or can be resolved. But, if the agitation is causing a significant problem for the person with dementia, drug treatment is justified. This should be given at the lowest possible dose for the shortest possible time; and treatment must be reviewed regularly to see if the problematic behavior has disappeared. 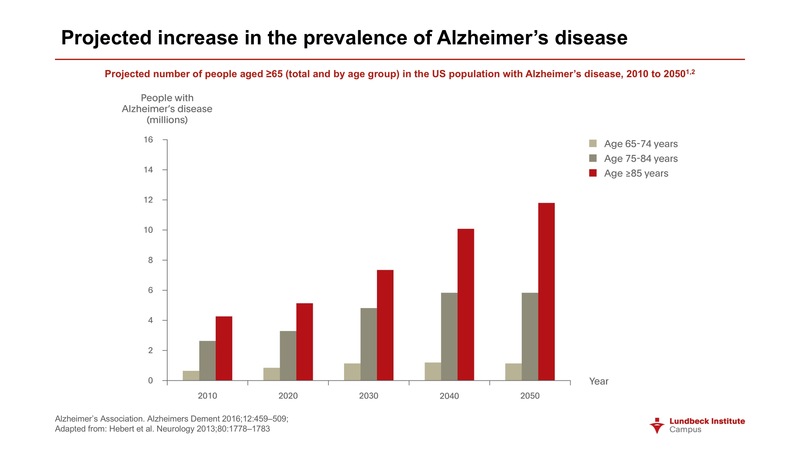 2016 Alzheimer's disease facts and figures. Alzheimer's Association. Alzheimers Dement 2016;12(4):459-509. Geda YE, Schneider LS, Gitlin LN et al. Neuropsychiatric symptoms in Alzheimer's disease: past progress and anticipation of the future. Alzheimers Dement. 2013 Sep;9(5):602-8. Cummings J, Mintzer J, Brodaty H et al. Agitation in cognitive disorders: International Psychogeriatric Association provisional consensus clinical and research definition. Int Psychogeriatr. 2015;27(1):7-17.